Private Frank Pike is a fictional Home Guard private and junior bank clerk; he was appointed as the platoon's information officer by Captain Mainwaring in The Man and the Hour. He is frequently referred to by Captain Mainwaring as "stupid boy". 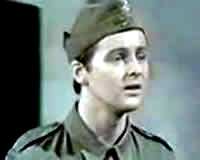 In the BBC television sitcom Dad's Army he was portrayed by Ian Lavender. Pike: "By the time we finish supper, it's always so late, you never leave our house until after I've gone to bed and then you're back early for breakfast before I'm awake. But what I can't understand is that I never hear you leave at night and I never hear you come back in." Wilson: "Well I let myself in and out very quietly"
Pike: "You don't do anything else very quietly!" Early in series 1, Pike does show some mild romantic attraction to Janet King, Mainwaring's secretary when he talks to her about his guard duties. In "War Dance", Pike becomes engaged to an Army girl called Violet Gibbons who works in a fish and chip shop, but it gets called off. Later on, Pike starts seeing a young cinema girl called Ivy, who speaks so quietly, nobody can ever hear her say anything. He briefly develops a crush on Hodges's niece Sylvia, but that quickly fizzles out. In "The Royal Train", it is revealed that Pike can drive a steam locomotive, having learned to do so at the Schoolboys' Exhibition. Pike is naive and acts childishly; he has limited grasp of adult issues. He is frequently found with confectionery, is upset in "The Big Parade" to leave a cinema early because he had "missed the Donald Duck" and can be petulant to superiors. This annoys Captain Mainwaring, who refers to him as a "stupid boy" due to his carelessness and mistakes and his bouts of childish humor. In "Gorilla Warfare", Mainwaring opines that Pike is "slightly retarded". Mainwaring treats Pike as a child, sometimes threatening to send him home from meetings if he does not behave. Mainwaring also treats Pike as a dogsbody, and gives him menial, demeaning, dangerous or undignified tasks, refusing to "mollycoddle" him. Pike frequently ends up wet, covered in mud or otherwise humiliated. In "Things that Go Bump in the Night", he was stripped several times and had to run naked through a field to escape dogs. Pike does however sometimes show some maturity. In "Menace from the Deep", when Pike has lost all the food brought out to the pier by not tying up the boat correctly, he apologizes to each member of the platoon on the pier. Although Pike comes up with sensible solutions to problems encountered by the platoon, he treats "everything as if it's a game", to quote Mainwaring in "All is Safely Gathered In". Notably, in "The Deadly Attachment", Pike was put on an ominous 'list' by a German U-Boat captain due to Mainwaring's incompetence at preventing the German from learning Pike's name ("Don't tell him, Pike! "), spelling his doom should the Germans win the war; however, as Pike had sung a childish song about Adolf Hitler in front of this officer, it is his own fault in refusing to take the situation seriously. He would rather play at being a Chicago gangster with the platoon's grenades or Tommy gun. He exasperates Mainwaring but he is humoured by other members, particularly Lance Corporal Jones, Private Godfrey and Private Walker. Pike is one of the most timid members of the group, but was the first in the series to fire on a suspected enemy in "The Enemy Within the Gates" even though it turned out to be a swan. Pike appears sickly and unhealthy, though most of his "illnesses" stem from his mother's protectiveness. She usually makes him wears a claret and blue scarf with his Home Guard uniform, which supposedly prevents him from getting croup, even though only infants and (apparently) chickens are supposed to get it ("Menace from the Deep"). Despite all this an army doctor certifies him healthy when he receives his call-up papers, though having a rare blood type excludes him from military service. Pike is a fan of the cinema and narrates the plots of films that relate to the platoon, even if the relationship is vague. When the film example does mirror reality, he picks scenarios which end in death. Pike makes pointless comments while trying to help: this is illustrated in "Absent Friends". Jones, Mainwaring, Pike and Wilson are searching for an escaped convict, with the help of the police. Jones: "Perhaps they're hidin' behind the bushes, sir. They do a lot of hidin' behind bushes, do policemen. Especially when they're knockin' people off." Mainwaring: "I don't think that's very likely, Jones." Pike: "In that film, 'Public Enemy Number One', they hid behind cars. But there aren't any here." Pike's name is a reference to the spear-like weapons issued to the Home Guard in 1942, generating "an almost universal feeling of anger and disgust from the ranks". Ian Lavender was invited to choose Pike's scarf from the BBC costume department. As a supporter of Aston Villa, he chose the team's colours. A series of Barclays Bank adverts featured Arthur Lowe as George Mainwaring retiring from his position at the bank, with Pike taking over as manager; Mainwaring refers to Pike as 'stupid boy' as he did in the series. Sgt – Save My Boy! When Did You Last See Your Money? This page was last edited on 9 March 2019, at 21:49 (UTC).